An admission: this Paul Dunmall week is my own true introduction to the British saxophonist’s work. How did I get this far without him? Speculation might turn up some illuminating insights re: access to good information about free jazz and improvised music, or divisions between said genres’ American vs. European counterparts. But the simplest, swiftest, and perhaps most relevant answer may be that the Michigan record stores where I’ve scored the bulk of my collection tend to be dominated by the excellent and abundant output of nearby Midwestern improvisers. It’s unhappily rare to come across releases on labels like FMR, host of over 70 Dunmall releases, or Slam, host of Subjects and Structures. So when Paul (Acquaro, that is) remarked in a recent e-mail that Dunmall’s “a prolific musician who deserves more coverage,” his words rang true to my experience. As for my belated introduction—“immersion” might be a better word—there’s not one album up for coverage this week that I didn’t fully enjoy, from the fire of Underground Underground to the quieter I Look At You, from Maha Samadhi’s bold brassy swing to the strange guitar/wind synth duet of Electrosonics. Anyone we decide to devote a week to certainly deserves the attention, and Dunmall’s no different. 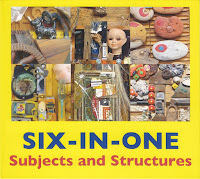 Subjects and Structures finds him as a member of Six-In-One, specially assembled by artists Walt Shaw and Andrew Coates to send off their August 2015 Artsmith gallery exhibition. The curated sextet puts together Dunmall on tenor sax with Bruce Coates on sopranino, soprano, and alto saxes, Corey Mwamba on vibraphone and recorder, Shaw himself on percussion and electronics, Seth Bennett on bass, and Mark Sanders on drums. The set consists of “Subjects” and “Structures,” a half-hour each, plus the brief “Nothing Is Paltry,” dedicated to the Spanish artist Antoni Tàpies. The eponymous hour-long dyad is a marathon act of group improvisation, ranging from high-energy bombast to restrained atmospherics. Over its course, everyone gets a fair chance to step to the fore. The group starts from the ground up with a wash of malleted cymbals, resonant vibes, whispery arco bass, and, of course, carefully swelling saxophones. On a broad scale, hearing the sextet masterfully escalate and de-escalate tension and dynamics, expand and contract from solo to full sextet and back down is a fascinating experience. On a closer level, tracking the interplay between individual musicians is equally worthwhile. The interplay between the Dunmall and Coates affords special attention, I suppose, especially as a way of highlighting Dunmall’s range of skills. (It helps that while he can often be found playing all manner of instruments, including not only the aforementioned wind synth but also bagpipes—see Paradise Walk—he sticks to tenor here, leaving his contributions easy to identify.) The two saxophonists prove exceptionally attentive and in tune to each other’s ideas, in some places shadowing one another in dazzling counterpoint, in others seeking sharper contrast. Dunmall maintains wonderful flexibility throughout, here stabbing wide-interval punctuation marks, there blowing fluidly. Like Ken Vandermark, he’s as adept at harnessing his instrument’s noisier potentialities as he is at exploiting its melodic tendencies. A true sign of veteran confidence, he’s as ready to take the spotlight as he is to let someone else. There’s a lot more you could say about Subjects and Structures—and I’d go on, but I’ve got more Paul Dunmall to listen to. Hello : I own around more than 140 cd's ( among them triple and 4cd's boxes) of Paul Dunmall = HE IS A GIANT !!!!!!!!!!!!!!!!!!!!! "